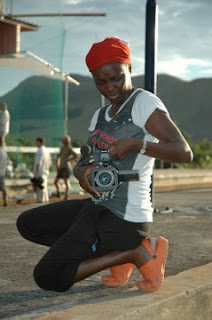 Multi-talented Nadine Otsobogo from Gabon is a filmmaker, make-up artist and founder of Djobusy Productions. She talks about Gabonese cinema, her experiences as make-up artist, her films and her passion for cinema. Nadine, you wear many hats in the world of cinema, some reflections? Well for someone who likes hats…? I am joking! I see myself as a very passionate person who wants to tell stories, to delve into them, and to give them life. Gabonese cinema is not very well known and yet, there is an active cinema culture there. What role do you hope to play in ensuring it a larger place in African cinema? Gabonese people have always been passionate about cinema. I think I am part of a new energy within Gabonese cinema, at least I hope. In the same way as my colleagues, Yeno Anongwi and Marc Tchicot, to name a few. This also implies that films which draw from sources beyond Gabon, that reframe its stories, are providing a boom to Gabonese cinema. In order for African cinema to be more far-reaching I want to move towards co-productions. In fact, I think that is the necessary course to follow at the moment, as the box offices in Europe are increasingly inaccessible. And perhaps it is just as well as it will force us to rethink our priorities and attitudes regarding a would-be contract. “Look to Africa for there a Black king will be crowned.” I like this prediction by Marcus Garvey, which sends me back to the motherland. In the context of cinema, this prophecy is loud and clear. During my diverse travels as make-up artist on African film productions, an unforeseen Africa was revealed to me: inquisitive, remarkable, striving, far from Western stereotypes. I would like to bring this perspective of the continent to my projects. There is a long list of films, of which several are renown, which is proof of your accomplishments as a make-up artist. What are your experiences in this profession, the required training, the specific tasks? What is your relationship with the directors, with the actors? I have over fifteen years experience as a make-up artist. I studied at a cosmetology and aesthetics school and trained at a school for professional makeup artistry. And for three years I was co-director of a make-up agency called Blush Poudre etc…, its services include make-up for entertainment and special events. During the film shoot the make-up artist must skillfully maneuver the actor’s appearance based on the script. The character may be made to look ugly or is beautified accordingly. The make-up artist works with the director, cinematographer, hairstylist, and wardrobe designer in advance in order to get their vision and input. I have worked on many films, such as Le Marsupilami et l'orchidée de Chixclub by Alain Chabat, Le collier de Makoko by Henri Joseph Koumba, The Screaming Man by Haroun Mahamat Saleh, Demain dès l’aube (Tomorrow at Dawn) by Denis Dercourt, Ramata by Léandre-Alain Baker, L’absence by Mama Keita, L’Ombre de liberty (Shadow of Freedom) by Imunga Ivanga, Neg’marron by Jean-Claude Flamand Barny, Et toi t’es sur qui? (Just About Love?) by Lola Doillon, Sexe, gombo et atiéké by Haroun Mahamat Saleh, Le Jardin de papa (Father’s Garden) by Zéka Laplaine, Moi et mon blanc (Me and My White Buddy) by Pierre Yaméogo, 40 mg d’amour (40 mg of Love) by Charles Meurisse. A film shoot is a microcosm of society. There are people who have good vibes and those who don’t. To be a make-up artist requires a great deal of patience, discretion and listening skills with both the actors and the entire crew. Being in harmony is a necessity. We are brought together to complete a project. That is the most important thing! My relationship with certain directors was more than a collaboration between make-up artist and director, it was a real exchange. They integrated me into the filmmaking process, it was “our film”, and it was very pleasant and satisfying. I give them all a big thank you from the bottom of my heart for their confidence, and to one in particular, who almost stopped the shoot after three days. He knows who he is! You have made several films (fiction and documentary). What has been your cinematographic trajectory? My first work was a short fiction film, Songe au rêve (Musings of a dream) directed and produced in Senegal and selected at the Carthage Festival in Tunisia, and the Afrique Taille XL Festival in Belgium. The documentary, Il est une fois…Naneth (Once upon a time…Naneth) is a portrait of the Gabonese singer Naneth Nkogue. The film is part of “Talents of Gabon”, a series of documentary portraits produced by CENACI (the national center for cinema in Gabon) and the French production company Playfilm. The film was prepared and shot in less than a week. Maady kaan, Escale à l’école des sables and Kellé are my first filmic essays. They are films about dancing and coming together. I did not ask myself if I should do it or not. I just took my camera and forged ahead. Then I had to find editors who had the same feeling and vision as I did. The dancers and my friends like the films a lot but I did not dare show them to people I did not know. When the Festival Plein Sud selected Maady Kaan, I was very happy, it was a wonderful reward. You created Djobusy Productions in 2010, what are its goals, its mission. First of all to be in the right place! To be spotted. And to create a dynamism in Gabonese filmmaking. To search for original stories, to bring together people in Africa and around the world who are passionate, curious, and competent. Co-production is essential to all projects. To make films, to present them at festivals, at film markets, to broadcast them, to reinvest in order to make more films. I have several projects in the works. I am in the preparation stage for the short film “She’s having fun”. And I am getting started on a documentary, a medium film, and a mini-series about the crewmembers that I have encountered in the four corners of the world. In addition, Djobusy is looking for scriptwriters.